Electrical accidents are a leading cause of mining fatalities, accounting for over 6% of deaths between 2000 and 2009. Compared with other industries, mining is among the most dangerous with respect to electrical injuries. U.S. Bureau of Labor Statistics data for 2003 to 2009 reveal that the mining industry has an electrical fatality rate approximately 8 to12 times the rate for all U.S. industries. Considering both fatal and non-fatal cases, electrical injuries are disproportionately deadly. Mine Safety and Health Administration data for 2000 to 2009 show one fatality for every 22 electrical-related injuries, compared with an average of one fatality for every 203 injuries for all other injury types in mining. 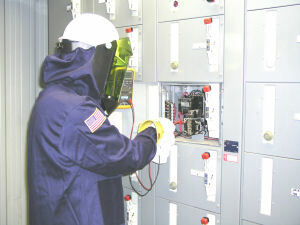 An electrician using a meter to test a 480V circuit, while wearing electrically-rated gloves, arc-rated face shield, and an arc-rated protective jacket. Researchers at the NIOSH Mining Program have addressed the prevention of mining electrical injuries over the years with numerous studies focusing on power system design, engineering controls, work organization and procedures, protective equipment, and human factors. Much of this work utilized the NIOSH Mine Electrical Laboratory. Research findings have included methods to avoid electrical cable hazards, improved power system grounding, techniques for preventing electrical ignitions which could lead to fires and explosions, recommendations for improved overhead electrical power line safety, strategies for mitigating arc flash hazards, and better understanding of electrical accident causes. Future electrical safety research by NIOSH will continue to address issues and hazards that have been linked to many past electrical injuries, as well as potential hazards from new technology. Examples include shock and burn hazards associated with switching equipment and cables, improved training, battery safety, and equipment permissibility.